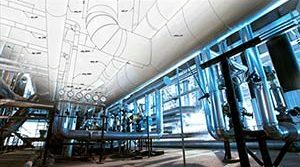 Wet Air Fan Cyclone for High Density Polyethylene Project | Piping Technology & Products, Inc.
Sweco Fab, Inc., a wholly subsidiary of Piping Technology & Products, Inc., and an ASME and API code vessel shop recently unveiled their design of a wet air fan cyclone for a new high density polyethylene project. 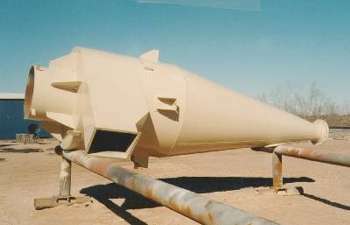 The barrel, which is a twenty-one feet long, tapers upward from a twelve-inch diameter base to a six foot diameter top. Ears on the exterior of the barrel are provided for support and alignment. 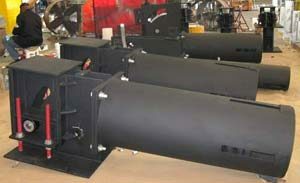 Air inlet is designed to mate with other components forming part of the process equipment. The fan cowling has outboard ears to facilitate ease of test, assembly and maintenance. The cyclone was rolled and formed from ¼ inch carbon steel and weighs 4,000 lb. Want to learn more about Sweco Fab, Inc.? Visit out webinar archives!